On the gameday march, the Notre Dame football team and staff slap a sign on the way to the field. This is a deeply rooted game day tradition in a place that already holds a lot of traditions. Slapping the sign – which reads “Play Like A Champion Today” is just one tradition in a multitude of gestures that exist throughout collegiate and professional sports. 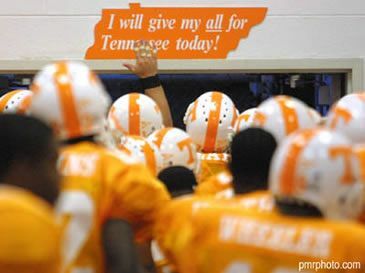 The Volunteer football team hits a sign that says, “I will give my all for Tennessee Today!” Virginia Tech hits the Hokie Stone which to some signifies the strong foundation and character of the state and the team. 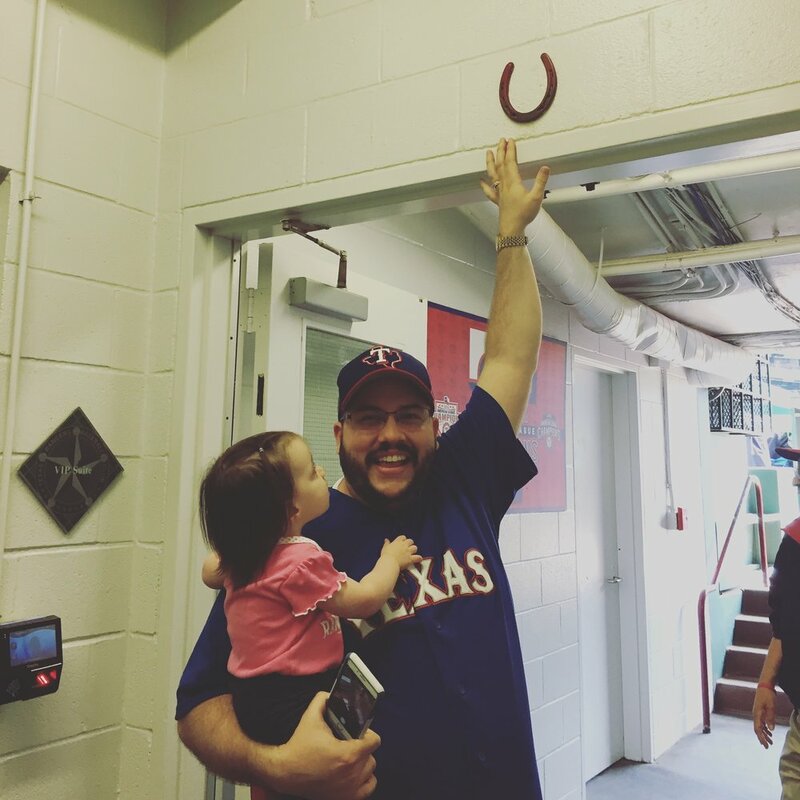 Last year, when my family went on a private tour of the Texas Rangers stadium, we were able to see the horseshoe above the dugout that the players tap on their way out to the field. While we are not a sports team rich in tradition, my family also has a sign to slap on our way out of the house. It reads, “I am not lucky, I am blessed.” My son, who will celebrate his golden birthday on February 2nd, will say, “hold me” (which sounds more like “hoad me”) on our way out so that he can hit the sign himself. Like most game time traditions, the slap signifies a deeper truth. For Notre Dame, it’s to play like a champion on the field and in life — which you can see that in their promotional video from years ago. For my family, our sign signifies that we didn’t get here by chance and that we won’t get where we want to be tomorrow that way either. Of the many ways this concept is signified in my life, being a parent is near the top. I had no intention of ever becoming a parent. When I was deep in my decade long gambling addiction, I thought about making myself happy. I didn’t want to be tied down or held back from anything that I wanted to do because I had kids that needed me to clean up after them or take them to practice. Yet, my heart changed after I found Christ and read Scriptures that said be fruitful and multiply (Gen. 1:28), talked about the blessings of having children (Psalm 127:5) and that God desires believers to teach the next generation (Gen. 18:19). Before my wife Megan and I were married, we had many discussions about what our future would look like. Among other things, we spent quality time having conversations about how many children we wanted and when we wanted to have them. We learned that having children was important to both of us and that we didn’t want to wait and spend a long season early in marriage by ourselves. Megan was pregnant with Maya a few months after we were married. I am not lucky. I didn’t happen upon a way to stop gambling. I didn’t take a magic pill to stop smoking and drinking. Christ inside me allowed me to do those things. My wife didn’t win the lottery when she met me, although she may feel like it! We didn’t have Maya and James because things just happened to go our way. God brought us all together so that we can be a blessing to one another. We know God’s plan is in place because my wife and I planned for James before we had Maya. We took taking wedding engagement photos to highlight our faith that our first born child would be a son and that his name would be James. God had other plans, sending Maya (named after Jeremiah) first. This was our first lesson as a couple to know our prayers won’t always be answered the way we expect. God has brought our children here and in the order He desires. Long before I met them, God said he knew them (Jer. 1:5). As much as my wife or I might want to take credit for creating my children (who look like carbon copies of my wife), it was God who ultimately created and shaped them. He has put inside them the personalities they use today and also installed dormant gifts and talents within them that (through their relationship with God) will awaken to be used to fulfill His sentence for their lives. Even though I only became a parent in 2015, I find it difficult to remember back to a time when I wasn’t one. I sometimes forget what it feels like to sleep in or have a couch that isn’t stained. I also forget what it felt like to be lonely. In my addiction, I never realized how lonely I truly was. Sometimes, the solution to heartache comes from solving a problem you didn’t know existed. My relationship with God and later my wife and kids satisfied a hunger in my heart I didn’t know was there. For you, I encourage you to understand you won’t get where you want to go in life through luck, fate or chance. I would also offer that where God wants you to go is always better than where you want to go yourself. And I think that trouble or emptiness you feel sometimes is there because Jesus wants to get into that area and you keep Him locked out.